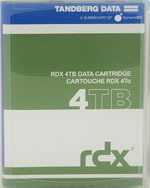 The 4TB cartridges fit any RDX disk-based storage system, including company's QuikStor removable disk system and QuikStation network-attached removable disk array which combine the benefits of tape - reliability, portability, archive life, and low cost - with the performance, speed and random access of HDD technology - providing a rugged, reliable, secure and convenient backup for the SMB and SME market. Also, in November, RDX hit its 10th anniversary milestone of worldwide deployments by staying committed to offering a rugged, reliable, high performance and convenient storage for backup, archive, data interchange and DR.
"RDX 4TB media and Tandberg Data's RDX QuikStation models fit perfectly into virtual environments," said Andy Spencer, marketing lead, Backup Exec product, Veritas Technologies, LLC. "Backup Exec16 in combination with the RDX QuikStation running in either disk mode or as tape library is a turnkey offering for the SMB market at a well suited price." 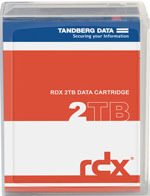 "As a partner with Tandberg Data, we have found their RDX solutions to be great storage products. They work perfect with our Archiware P5 software suite for backup, synchronization, and archive," said Marc Batschkus, manager, business development, Archiware GmbH. 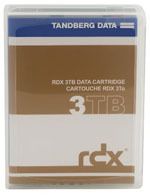 "Their launch of 4TB cartridges expands the RDX solution range especially for video, post-production and broadcast. We are pleased to continue our great partnership with Tandberg Data and congratulate them as they reach their 10th anniversary for RDX." "4TB capacity media is another milestone for our RDX technology which is celebrating its tenth anniversary this year," said Hugo Bergmann, product manager, RDX storage and software solutions, Tandberg Data. "Tandberg Data continues to demonstrate its leadership position for removable disk and removable disk appliance market with more than 850,000 RDX systems and over 2.9 million cartridges representing a capacity of over 1.4EB sold worldwide since we introduced our RDX range in November 2006." In addition to traditional server and backup applications, the 4TB RDX cartridge is for usage in data-intensive environments, such as professional workflow and archiving, hybrid cloud applications and database seeding. The RDX QuikStor offers data retrieval that is simple and painless by providing features like fixed disk mode that allows a seamless integration into Windows-backup. SATA III and USB 3.0 interfaces make system integration easy and provide data transfer speeds of up to 330MB/s. Users can select between 500GB, 1, 2, 3 and 4TB cartridge capacities or 128 and 256GB SSDs. The three-year warranty and advanced replacement service, plus a rugged, shockproof design means data remains protected even under extreme conditions. 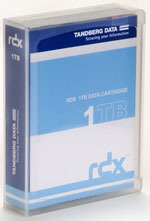 Contact your BackupWorks.com account rep today at 866 801 2944 for all your RDX storage needs including the new RDX 4TB cartridge.